@Mad Br0, check the description and tags. @MattressLumps, I wonder what the total was. @Mad Br0, just make the damn burrito!!! @Samime, better than them coming in and trying to order 27 items at the front and holding the line up, right? Did anyone else count the check off marks to see if there were 27? You can order Chipotle online?!? @Conan34, there's an app! I'm literally about to do it! @sweaterpuppies, my god. Now I barely even have to talk to people! This is great! I'm a cook in a kitchen and that's not that crazy. If any Chipotle employees use Funny Pics, they're in for a treat. I'm concerned with the large oil drum sitting in what I assume is a restaurant? I count 26? ... Oh wait. I once had a new server ring in her whole section on one ticket, her first day solo. 7 freaking tables on one chit. Freaking A. A pizza delivery guy came to my job and had me sign the receipt. I look at it and its for 197 and something and I'm like all that for three pizzas? He was like oops thats my next delivery. @vonwulf337, why didn't your manager call them and just say "Sir/Mam?... No." That's actually not that bad. 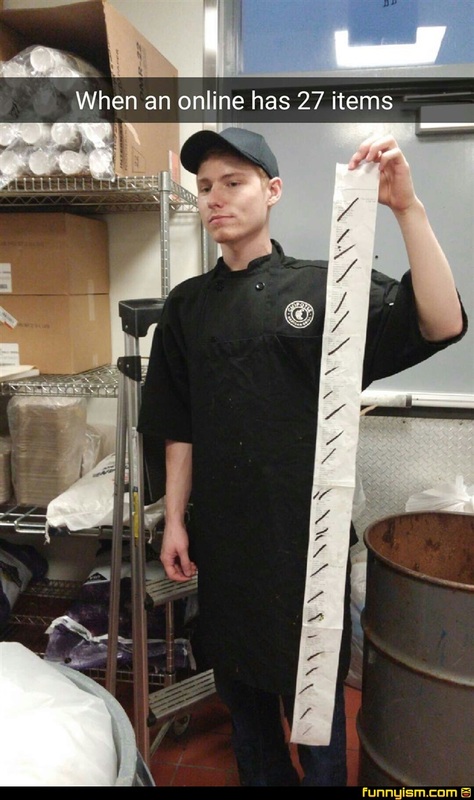 Can you imagine standing there waiting for that one person to place 27 orders? Anyone else lost? No, ok.
@x2 6x 9 lol, check the description and tags. @ Officer Shaft, very well then.